"It's Always Something...": Tiger Parenting? I know 'squat' about parenting. There you have it. But what I have observed is that many middle-class American kids are OK with getting a C, are praised ad nauseum, win awards for just 'being there', and have developed few coping skills for managing life's basic disappointments. To me, this makes for stressed-out, frustrated adults, but again, I know 'squat' about parenting. 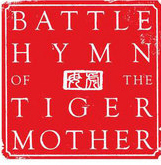 According to Amy Chua, Yale Law School professor and author of Battle Hymn of the Tiger Mother, there is a very good reason why Asian children stereotypically excel in mathematics and music. It's all in the way they were raised. Recently, The Wall Street Journal published Ms. Chua's essay, Why Chinese Mothers are Superior . I'll bet the mere title of that article ruffled a few feathers at the playground..
your children must be two years ahead of their classmates in math. if your child ever disagrees with a teacher or coach, you must always take the side of the teacher or coach. the only activities your children should be permitted to do are those in which they can eventually win a medal; and that medal must be gold. Hmmmm. No TV? No sleepovers? What do you think? This is bizarre. I do think that parents today OVER-PRAISE their children, and I think that children today have a false sense of accomplishment. Kids need to know that they aren't the best at things and that it is not acceptable to argue with adults in certain situations. That said- no sleepovers? WEIRD! I'm on the fence on some of this but strangely agree with some. Yikes! While I definitely agree that our (in the societal sense, since I don't actually have any) are completely and totally coddled into mediocrity, I have to say I don't agree with most of what this author has to say. Coming from a Lutheran household where standards were high, but parental involvement was low, I completely get wanting our kids to achieve, but not attending sleepovers? Not picking their own extracurricular activities? I would like to know how her children turned out. Are they merely automotons leading the life that SHE wanted for them or do they actually ENJOY things? How do we figure out what we enjoy and are actually good at if we are not allowed to make some decisions on our own and fail in an environment that should be able to show us how to fail gracefully?